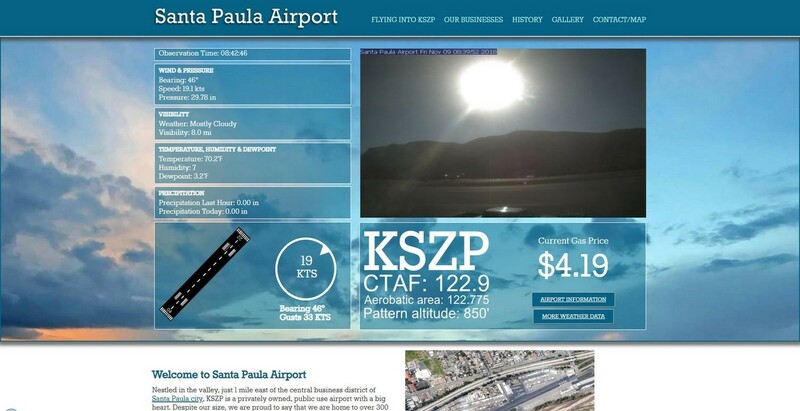 The original Santa Paula Airport site was dated and had broken items on it, such as the weather and webcam. Together with our programmer, we combined both ASOS and cam feeds into one central location then feed it out to the website. Now the site features a 2-second update cam, realtime wind speed and direction indicator, plus years worth of weather statistics. We also added new content - such as details on the acrobatic area (courtesy of Judy at CP Aviation - another of our clients), plus reorganized the information into a much more user-friendly layout.